After “Midnight Ron,” I’m wondering if maybe I was being a bit hasty in my judgment of Archer’s newly minted step-father, Ron. Prior to this week’s episode, we hardly knew him. To us, he was, as Malory put it, “the most boringest man alive” (but not quite in those words). With this episode, however, Reed once again masterfully brings a new character completely into the fold, initiating him as just another one of the gang, so to speak. Ron might only be Archer’s step-father, but “Midnight Ron” shows he’s closer to his step-son than either of them (or Malory, especially) would like to admit. 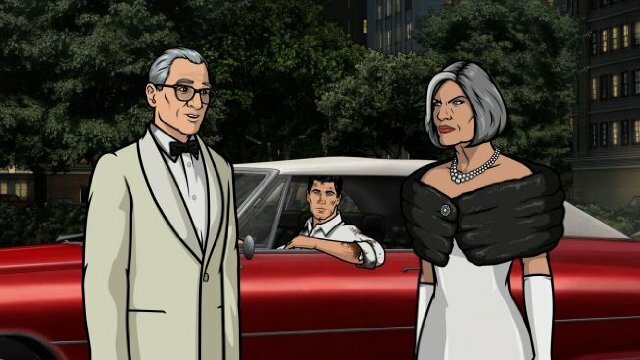 Archer’s rapid-fire references still fly as far over Ron’s head as Archer did from his trunk, yet there is one thing they found to bond over: doing things they know will just stick in Malory’s craw (phrasing!). My question is whether this is a sign of things to come, Archer and Ron becoming the world’s least likely father and son team, or if Ron will return to his earlier status as resident Buzz Killington. I hope it’s the former, and I doubt I’m alone on that. Who doesn’t want to see Ron’s former cohort, the one whose lackies caused (“overcompensating”) Ron to swerve off the road and through a guard rail, make an appearance? Perhaps we’ll learn that Fat Mike has worked off those extra pounds. Whatever’s become of him, I want to know. For that matter, I want more insight into Ron’s former life of crime. You can’t show him and the rest of his group stealing a tank and then not show us what they did with it. Is it too much to ask for Archer to convince old step-dad to relive old times with him and steal a tank or two? A taste of Ron as he once was is fine and all, but what I’m curious about is if he’s still got it. His alcohol-fueled decision to pick up his stranded step-son had an Archer-like quality to it, except we didn’t see so much of the follow through. Chances are, though, Ron was just out of practice. Maybe, instead of him teaching Archer valuable life lessons, it’ll be the other way around with Archer helping to welcome him into the present. Of all the things the two of them could do to infuriate Malory, Ron letting Archer turn him into a ghost of Archer’s future, with Ron transforming into the one in need of micromanaging, would probably draw the most ire. Wherever Reed takes their relationship, though, I trust it’ll work. Even if it gets put largely on the back-burner, I’m sure he’ll make the most of it, much like he did with the brief appearances by the rest of the cast. We have Kreiger cowering in front of a creature of his own design, one which looks like the sort of thing Archer’ll probably be expecting to come up out of every toilet he uses from now on. As if Archer needs another irrational fear; would someone be kind enough to compile a list of them all? This week it was mutant alligators in the sewer system. Two weeks ago it was Predators and Entmoots. I have to give Reed credit for the variety; yet every last one is perfectly in keeping with the character he’s crafted. As is Lana’s reaction to Archer’s pleas, which any follower of the show should’ve seen coming. But, to be truthful, I hoped her protestations would be her own version of Archer’s elaborate voice-mail recordings. Isn’t it nice, though, when a television series has such a bevy of characters that it can relegate most of its cast to bit-parts and still not miss a beat? Even more so when it can make said bit-parts arguably the most memorable thing about the entire episode. Clearly, Reed is no chlyamidiot; the man knows what he’s doing, and is one of the few showrunners I have complete faith in. Admittedly, he could torpedo Archer like he did Frisky Dingo in its second season, a case of a show literally getting worse by the episode, but I’d say a little over three seasons is enough for me to stop holding that against him. Besides, Frisky Dingo never was a match for Archer, not even in its comparatively consistent first season. Which is to say that Archer has further to fall and, thus, could survive a minor downturn if it came to that. But, still, I don’t see it happening anytime soon. Is it going on to have as long a run as The Simpsons, or Reed becoming as big a force in animation as MacFarlane, too much to ask for? Because I don’t think it is. Can the film those cross-dressing truckers were making be some sort of special feature on the season four DVD, please? I’ve grown rather cold to Archer’s verbal and physical abuse of Woodhouse, but his realization that there’s nothing and nobody else out there for him was legitimately heartbreaking.